The Abu Ghraib of Los Angeles? 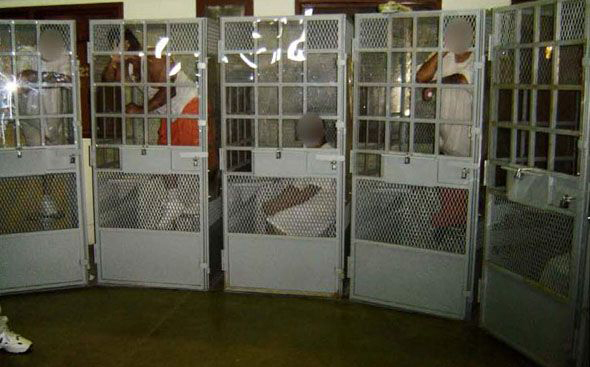 ACLU lawsuit cites a “sick culture of deputy-on-inmate violence” in LA County jails. The state has also faced lawsuits over prison conditions; click for a slideshow. From Brown v. PlataOn Wednesday, citing “a sick culture of deputy-on-inmate hyper-violence [that] has been flourishing for decades in the darkness of the L.A. County Jails,” the ACLU sued the Los Angeles Sheriff’s Department seeking better training for deputies, and better oversight, investigation, and discipline in cases involving prisoner mistreatment. With 15,000 inmates—a majority of them awaiting trial, yet to be convicted of a crime—LA county hosts the nation’s largest jail system. In recent years, its guards have become known for a level of brutality that exceeds that of most maximum-security prisons—and sometimes crosses the line into torture. The suit draws on information published in a report released last September by the ACLU’s National Prison Project and Southern California branch. The report showed a pattern of brutal abuses carried out by what the report calls a “savage gang” of deputies who oversee the prisoners. “Like members of street gangs, these deputies sport tattoos to signal their gang membership,” the lawsuit alleges. “They beat up inmates to gain prestige among their peers, and ‘earn their ink’ by breaking inmates’ bones.” The suit claims that Sheriff Lee Baca and his top brass are well aware of the system’s “culture of violence” but have done little to change it. Juan Pablo Reyes was punched by Los Angeles County sheriff’s deputies over and over again in the ribs, mouth, and eyes, breaking his eye socket and leaving his body badly bruised. After falling to the ground, the deputies continued to kick Reyes, an inmate at the Los Angeles County Jail, with their steel-toed boots, ignoring his cries. And the deputies didn’t stop there. They ordered Reyes to strip and forced him to walk naked up and down the hallway of a housing module, in full view of other inmates. One deputy yelled, “Gay boy walking.” Reyes began to cry, but the deputies just looked on and laughed. They then put him in a cell where he was beaten and sexually assaulted by other inmates. He desperately pled for help and to be removed from the cell, but to no avail. In another incident, an inmate who discovered after deputies had searched all the cells in his row that some of his property was missing was savagely beaten after asking to speak to a sergeant. Deputies beat this inmate so violently he suffered a fractured jaw and required eye surgery and stitches in his ear. A deputy shoved him hard against a wall, slapped his ear, punched his face several times and then threw him to the ground. While on the ground, the inmate was kicked by the deputy roughly 10 times in his face, jaw and back of his head, causing a large pool of his blood to form on the floor. The inmate described the beating as being more painful than being hit by a car. The ACLU has been the court-appointed monitor of conditions in the LA county jails since 1985, and has produced critical reports in the past. But the new report notes that it is “the first in which a chaplain and other civilian eyewitnesses come forward with first-hand accounts.” It is also the first to show the lengths to which Baca has gone to ignore, downplay, or cover up the abuse. In a September news conference, Baca defended his deputies and dismissed the report. Later, under a barrage of news coverage, he declared that he was ultimately responsible for problems in the system. Beyond the lawsuit, the ACLU is calling upon the Justice Department to launch a complete investigation into the various allegations contained in its report. Be sure to read our report on the ongoing crisis in California’s state prisons and our blockbuster package on incarceration in America. Afghan Prison Abuses: What Did Americans Know? And When Did They Know It?